And since I found these old photos, I thought I'd scan them in and share them here. Over the next few days (maybe even weeks), I'll show you some interesting things I've made over the years and post some additional previously mentioned shots of projects I've blogged about in past posts. To start, the bear quilt. You might recall that I blogged about the baby blocks quilt in early December. As mentioned in that blog, I've made several versions of this quilt over the year. One was this teddy-bear-in-sailor-suits version (too distinctive for publication, of course, but cute none-the-less). Second, I love this quilt because it's so easy to construct. For the pieced blocks, you cut eight 2"-wide strips across the width of each of the two fabrics and sew them together in sets of four, alternating light and dark. Then the pieced strips are cut 2"-wide, flipped top to bottom, and sewn together so they make 18 checkerboard blocks. When you're cutting the borders (which you need to do before you cut the blocks), you have to pay attention if you're using directional fabric. The side borders are cut at 6" x 47", and the top and bottom borders are cut 6" x 44" (basically, across the width of the fabric). And this is the important part. Use your fabric as a guide--if it's only 43" wide sans selvedge, cut your borders a little bit narrower, because you don't want to have to piece the bottom and top borders. Then, once you have the borders cut, cut the 17 solid blocks 6-1/2" square. The inner border is cut at 1-1/2" wide--cut five across the width of the fabric and piece the side borders as necessary. And the binding is cut however you want to do it--I usually cut mine 2" wide and do French fold binding. Then you just sew the center blocks together in rows, alternating the checkerboard and solid blocks. Then sew the rows together, then add the inner and outer borders. Quilt it, bind it, and don't forget to add a label (something I'm terrible about remembering to do), and you're done! 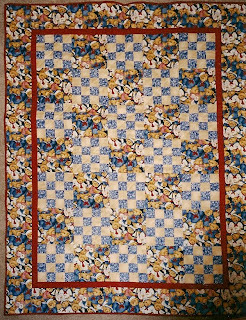 Do you have a favorite quilt pattern that you can create in a short period of time and you do, over and over again? Or are you going to tackle this one? I'd love to hear about it. If you've blogged about it, post a link in your comment so I can check it out. I really like the design of your quilt. If I make up my own design, I nearly always find myself sashing my blocks, and that gets pretty old. This would be a good alternative. The pieced blocks really set off the larger blocks nicely. What a lovely quilt. I love this simple pattern and have used a similar one over and over again, sometimes using a 19 patch block, nine patch block, or even a 4 patch block. It really is so versatile. I also have made a couple where instead of a pattern fabric for the bigger blocks I have used chenille or Minkee! It's amazing how much dimension you were able to get with this quilt. Good job!! You make it sound so easy. Thanks for the step-by-step instructions. It's a very cute design. What a sweet quilt! I like the design.